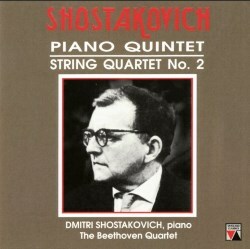 The Piano Quintet was composed in 1940 in the wake of Shostakovich's prolonged work re-orchestrating Mussorgsky's Boris Godunov. He described the Quintet developing 'almost simultaneous' in his mind with that effort. The work was instantly popular in the USSR and was taken up by Western ensembles equally quickly. This rapid acceptance was reflected at home in the award of a Stalin Prize in 1941. The composer himself remarked in a letter that this quintet was 'by nature .. more serious and kind of deeper than (a) quartet'. That, coming from the man who went on to write such profound quartets, is quite some throwaway remark. However, given that he had only written a single String Quartet at the time, the 1st dates from 1938, he has to be forgiven for his lack of foresight! As is shown in the next String Quartet Op.68, he very firmly rejects his own comment and produces a searing piece full of powerful ideas that sets the standard for the long series of thirteen further quartets that were to follow, right through to the end of his life. Taken together these can fairly be described as amongst the greatest works in this genre since Beethoven. This Second Quartet consists of four movements including a brooding waltz and finally a huge set of variations of astonishing imagination. The Beethoven Quartet premiered almost every one of the quartets, preparing them with the cooperation of the composer. By the end of this unsurpassable performance one can only take a deep breath and sit in silence. The history of these two recordings is only partly known and a little mysterious. This CD was first issued in 1994 but the two works were released by Vanguard on LPs VRS 6032 and 6033 claiming them to have been remastered from the original tapes. The Quintet was first issued in the UK on LP on the Parlophone label (PMA1040), along with the Third Quartet, in August 1958. To add to the complexity, and unfortunately for the writer of the insert notes of this CD, who claims it as a premiere recording, the Quintet appears to have been recorded twice by these same forces. Shostakovich made 78s in 1940 with the Beethoven Quartet who, incidentally, had the same membership from 1923 till 1960. That performance was released on CD by Multisonic in 1993 and shows how the performers, though just as powerful, took slower tempi, for it lasts about 7 minutes longer. It is of course in very ancient sound. This present issue, though only mono, is more modern, or perhaps less ancient sounding. This performance too is highly charged and executed with the utmost skill. It should not be forgotten that Shostakovich was always a fine pianist. Nothing about the presentation is changed yet Vanguard Classics have put it back on the market as a new issue. The CD is still dated 1994 and the notes are still a straight reprint from the LPs. There is no indication it is mono, but it is, and precisely nothing about the source of the recordings. All the above information is my own online research. Both these performances should be in every self respecting Shostakovich collection no matter how many others one has. The presence of the composer as pianist makes this essential.